I'm reading through John Owen's classic, The Glory of Christ, with a couple of other guys. My desire is to create a list of study questions to help further our thinking about each chapter. I'll be posting them here, as we work our way through the book. 1. John Owen starts this chapter by introducing the “mystery” of Christ’s person. Describe, in your own words, this “mystery”. 2. List the “two evils” of Satan’s first sin. 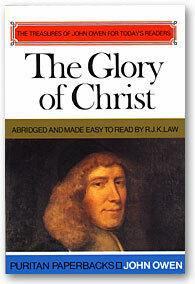 (p. 29) How does Owen suggest that the glory of Christ in His person frustrates Satan? 3. What importance does Owen place on the glory of Christ as it relates to the church? 4. Describe the imagery we see in Exodus 3:2-6 (Moses & the burning bush) of the glory of God in the person of the Son. 8. Read Isaiah 6 and John 12:36b-41. Based on your understanding of these passages and Owen’s remarks on the bottom of page 32 & top of page 33, who do you think Isaiah saw? Explain your answer. 9. What other passages come to mind where we see the glory of God expressed in the Son? 10. What does it mean to meditate on Scripture? What instructions, warnings and observations does Owen make on p. 34 regarding such meditation? 11. John Owen wants us to increase our thoughts of Christ during the day (p. 35). What practical ways can we accomplish this?